Safely remove painted coatings from drywall, wood, and more with no damage to the surface and dust free! 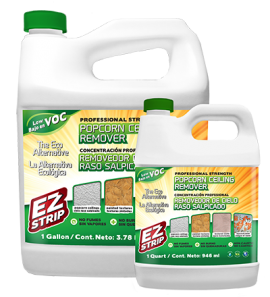 EZ Strip products are water based, skin safe, and fume free. Perfect for use by Professionals, DIYers, and Consumers. Coverage for EZ Strip Professional Strength Popcorn Ceiling Remover is approximately 20 – 25 square feet per quart/litre. Now Available In Store At Your Local Home Depot in Los Angeles, CA & Dallas, TX Locations!